Ruth Joan Bader Ginsburg (born March 15, 1933) is an Associate Justice of the Supreme Court of the United States. Ginsburg was appointed by President Bill Clinton and took the oath of office on August 10, 1993. She is the second female justice (after Sandra Day O'Connor) and the first Jewish female justice. Ginsburg is considered a member of the more liberal side of the Supreme court. 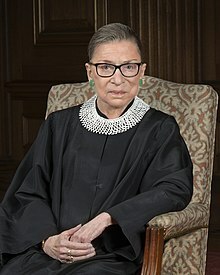 Ginsburg had surgery for colon cancer in 1999 and for pancreatic cancer in 2009. On November 8, 2018, she was hospitalized after fracturing three ribs in a fall. ↑ Domonske, Camila (November 8, 2018). "Ruth Bader Ginsburg Hospitalized After Falling, Fracturing 3 Ribs". NPR. This page was last changed on 22 April 2019, at 17:35.